"The "confirmation bias" of precedent can make manifest evil look accepted benign and inevitable." I think the post Civil War era's Blyew and Cruikshank precedent pretty much CONFIRMS manifest evil disguised as benign and inevitable. The massive on going manifest evil in the clearly criminal Federal Judiciary's conspiracy against rights, has BOTH mens rea and actus reus for their ACTIONS! The assertion of the potential of "continual calumniations" and "vexatious actions" does not excuse the denial of rights, the raison d'être for their existence. I seek the constitutionally and statutorily secured civil and criminal redress for the justifiable grievances, the denial of rights. The fraud exception to rei publicae, ut sit finis litium, and nemo debet bis vexari pro una et eadam causa is self evident to me, but alas I believe in the "sense and reason" of a Supreme Law of The Land. You assert judicial interpretation. 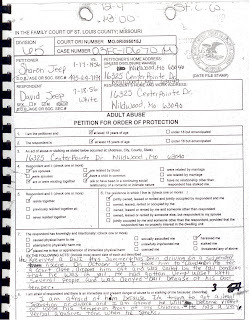 Here we agree as noted in United States v. Throckmorton, 98 U.S. 65 (1878) is applicable here "But there is an admitted exception to this general rule in cases where, by reason of something done by the successful party to a suit, there was in fact no adversary trial or decision of the issue in the case. Where the unsuccessful party has been prevented from exhibiting fully his case by fraud or deception practiced on him by his opponent, as by keeping him away from court." Not only was the petitioner, the unsuccessful party, never given a chance to defend himself, he was never even given the specifics of the cause for the finding under which his son, his life and all his belongs were taken. "The Court finds--First of all, the Court amends the pleadings to conform with the evidence adduced. The Court does find the allegations of the amended petition to be true." Just so you do not think I am some kind of after the fact complainer. 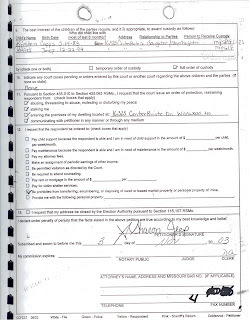 My attorney of record, made note of the issue beforE the hearing, was over ruled, made note of the issue DURING the hearing was over ruled and filed TWO post trial motions both asking for details of the amended pleadings and then to be heard on same to no avail. Because of this denial of rights, the petitioner was quite literally thrown out in the street with little more than the clothes on his back as an infamous scoundrel, drunken abuser. I was then forced to fight the recipient of my home, my son and all my worldly property in court, from a greatly diminished position, monetarily, physically and most importantly EMOTIONALLY suffering from undiagnosed post traumatic stress!!!! I cried myself to sleep for WEEKS!!!!!!!!!!!!!!!! I realize a decision in favor of the petitioner would require exertion of necessary and proper authority from the federal Judiciary under color of law, but that is exactly what the 14th Amendment requires by asserting that No State Shall. The assertion in Giles v. Harris, 189 U.S. 475 (1903) that the Federal Judiciary does not have the resources or the responsibility is just FALSE. Not only does the Federal Judiciary have the delegated constitutional authority to enforce the 14th Amendment on the states, that is "the sense and reason of the law," its "raison d'être." a. 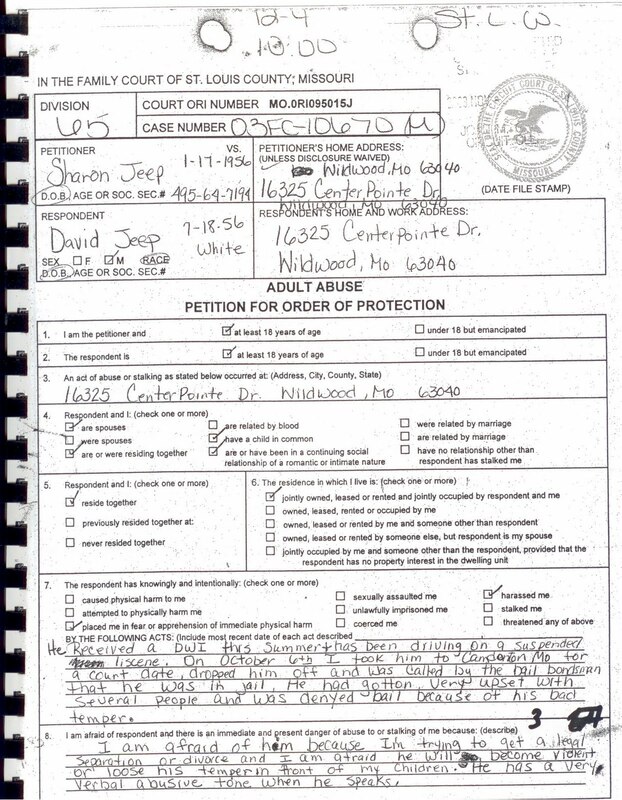 "Copy handwritten ORIGINAL petition dated November 3, 2003"
 The Legal Latin for "guilty mind"
 The Legal Latin for "guilty act"
 Justice William O. Douglas dissenting in Pierson v. Ray, 386 U.S. 565 (1967)confirmed this "I cannot believe that judges . . . would fail to discharge their duty faithfully and fearlessly according to their oaths and consciences . . . from any fear of exposing themselves to actions at law. I am persuaded that the number of such actions would be infinitely small, and would be easily disposed of." Dawkins v. Lord Paulet, L.R. 5 Q.B. 94, 110 (C.J. Cockburn, dissenting). Title Civil 42 U.S.C. § 1983 & 1985 and The 1st Amendment secures the constitutional right to a lawfully un-abridge-able justifiable redress of grievance from the government: "Congress shall make no law abridging the right of the people to petition the Government for a redress of grievances." It is for the public good that there be an end of litigation. No-one shall be tried or punished twice in regards to the same event, "double jeopardy." The combination of the TWO issues into one created the DEVASTATION in my life. 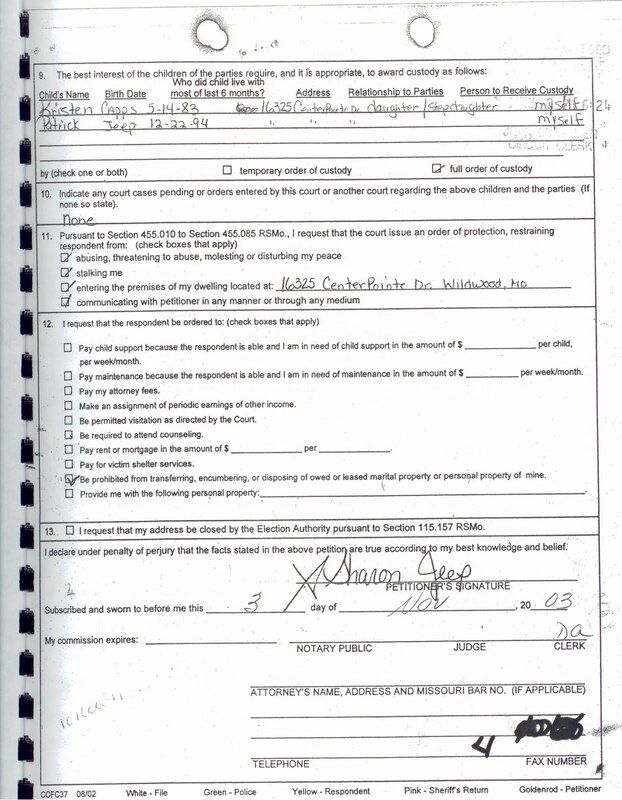 The successful parties to the suit include the Judge Goeke, Commissioner Jones, Sharon G. Jeep and Kristen Capps in 03FC-010670 and Judge Bennett's conspiracy, Judge Colyer, The Prosecutors (denial of exculpable evidence) and Police Officers (false testimony) in CR203-1336M. Probable cause is the most element of all evidence. How can you have a trial when there is no viable probable cause provided (Eighth Circuit court of appeals case 07-2614 (4:07-CV-1116 CEJ, 03FC-10670M / 03FC-12243))? Amendment XIV, Passed by Congress June 13, 1866. Ratified July 9, 1868., Note: Article I, section 2, of the Constitution was modified by section 2 of the 14th amendment. Section 1. "All persons born or naturalized in the United States, and subject to the jurisdiction thereof, are citizens of the United States and of the State wherein they reside. No State shall make or enforce any law which shall abridge the privileges or immunities of citizens of the United States; nor shall any State deprive any person of life, liberty, or property, without due process of law; nor deny to any person within its jurisdiction the equal protection of the laws."